Spinach is a versatile green that is high in essential nutrients. One 1/2-cup serving of frozen spinach has 20 calories, 2 grams of dietary fiber, 3 grams of protein and several vitamins and minerals. Though you may purchase fresh spinach for salads, frozen spinach works best with casseroles, sautes, soups and warm, cooked foods. Frozen spinach is usually the flat- or smooth-leaf type, which has unwrinkled, spade-shaped leaves and a milder taste than savory varieties. Purchase frozen spinach at your grocery store, or freeze spinach from your garden or farmer's market. Store frozen spinach in your freezer for no more than 10 to 12 months for best results. Storing spinach longer results in freezer burn, dry leaves and brittleness. Label the package with the date of purchase before you put it in the freezer to keep track of time. Keep the spinach package sealed and frozen until just before you use it to prevent drying out or spoilage. 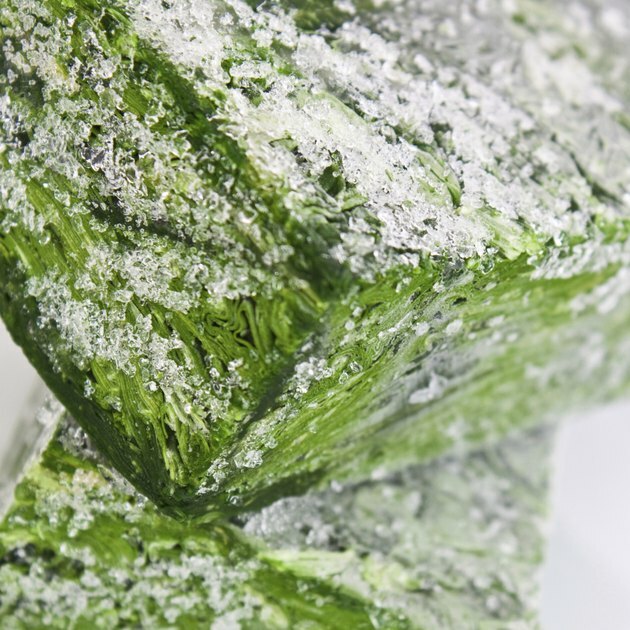 Once you open frozen spinach, you can keep it in the refrigerator for up to four days before you discard it. Do not rinse frozen spinach before use because it has already been cleaned. Thaw it in the refrigerator, rather than on the counter, because thawing frozen foods above 40 degrees Fahrenheit encourages bacteria growth. Most frozen vegetables retain better texture and flavor if cooked directly, though frozen greens like spinach are best if partially thawed before cooking. Cook frozen spinach thoroughly before you eat it to destroy bacteria. Spinach manufacturers blanch spinach, or lightly boil it, before freezing to preserve freshness. Therefore, frozen spinach is denser than raw spinach and provides higher levels of vitamins and minerals per serving. Frozen spinach has 190 percent of your recommended intake of vitamin A per 1/2-cup serving, as well as 15 percent of your vitamin C, 10 percent of your daily calcium and 20 percent of your iron. Additionally, spinach provides vitamin E, vitamin K, magnesium, folate, iron, vitamin B-6, calcium, potassium, protein and omega 3 fatty acids. Consider having fruit juice, citrus fruit or tomatoes along with your spinach, because the extra vitamin C facilitates absorption of iron and calcium. Freeze fresh spinach by first rinsing it thoroughly, then removing any woody stems. Blanch, or submerse the fresh spinach in boiling water for two minutes, then immediately chill it in ice-cold water to stop the cooking process. Press out excess water and wrap your spinach in airtight plastic wrap or food-storage containers. Label and date your spinach, then store it in your freezer. You may also preserve canned spinach by putting it in an airtight container and freezing it for up to two months. Do You Cook the Spinach First for Quiche?